We have created the perfect shirt for the creators of this generation! All our products are made with love and care in the NØLSON atelier. Our mission to create the perfect shirt began with combining traditional craftsmanship with a modern and clean Swedish design. This amazing combination has resulted in a shirt that is made of the finest cotton fabrics, exceptional craftsmanship and pure design. With this approach, we try to break the rules between formal and casual wear. Due to our clean yet stylish design it becomes possible to wear our products at both formal and casual occasions. You decide how to wear your NØLSON shirt. Feeling casual? Go ahead and mix your NØLSON shirt with stylish denim jeans for a cool street look. Are you the more traditional type of guy? Show it off with a clean look by combining your perfect NØLSON shirt with a classy jacket or suit. Our shirt collection is divided into 5 different lines. 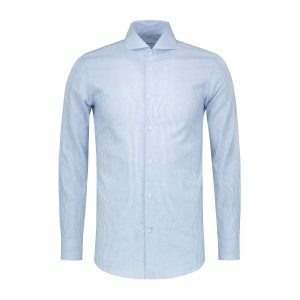 The NØLSON shirts are categorized into: TÖRE, STOCKHOLM, MALMÖ, ÅRE, PITEÅ, SUNDRE & BÖDA Styles. These 7 different lines will have the exact same slim-fit and design. However we offer a variety of different premium cotton fabrics that our atelier uses to create the perfect shirt. Our new TÖRE model is a one of a kind 100% cotton stone washed Denim shirt. This “ready to wear” shirt is made from premium durable two-ply cotton. Due to the amazing “Twill” weave and stone wash finish this shirt is extremely soft and surprisingly warm. Our modern slim-fit cut and exceptional cutaway collar sets you apart from others. 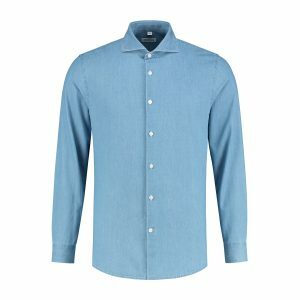 This new TÖRE Denim shirt is fitted with a single cuff, 2 horizontal buttons bevelled front. Which allows you to adjust the cuff to your preference. We have now even equipped our signature “extreme cut-away collar” with a fresh pair of additional collar stays to keep your collar in the right position at all times. Due to our modern slim-fit cut and the cool denim fabric this beautiful shirt can both be worn casual as formal. This gives you the opportunity to wear your favorite shirt at any given moment. Our Stockholm white shirt is cut from 100% pure cotton. This “ready to wear” shirt is made from premium durable two-ply cotton. Due to our amazing “Twill” weave this fine woven fabric creates an extreme level of comfort and feel. Our modern slim-fit cut and exceptional cutaway collar sets you apart from others. 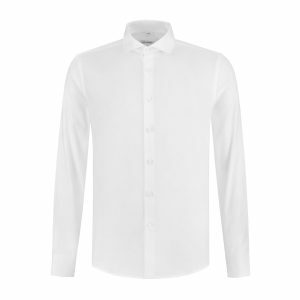 The Stockholm white shirt is fitted with a single cuff, 2 horizontal buttons bevelled front. Which allows you to adjust the cuff to your preference. We have equipped our signature “extreme cut-away collar” with the option to fit in collar stiffeners when needed. Due to our modern slim-fit cut this shirt can both be worn casual and formal. This gives you the opportunity to wear your favorite shirt on every occasion. 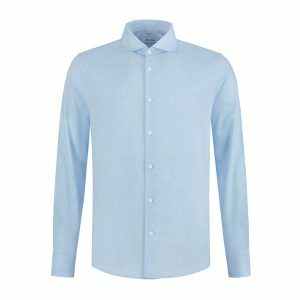 Our Malmö light blue shirt is cut from 100% pure cotton. This “ready to wear” shirt is made from premium durable two-ply cotton. Due to our amazing “Oxfort” weave this soft fine woven fabric creates an extreme level of comfort and feel. This Oxford fabric with contrasting colors in warp and weft gives this shirt a miniature diced pattern. Our modern slim-fit cut and exceptional cutaway collar sets you apart from others. We are very happy to introduce you our new ÅRE Shirt. This light blue striped shirt is made from our Self-sourced fabric. The ÅRE shirt is made from an extraordinary blended fabric. The fabric is made from a blend of 65% cotton and 35% polyester. In this way the ÅRE shirt has the comfort of a cotton shirt while it is very easy to care & iron due to it’s 35% polyester blend. The shirt also has a cool yet stylish striped pattern in the weave of the fabric. This striped pattern symbolizes the crisp ski slopes situated in ÅRE, Sweden. The striped pattern gives this shirt the perfect look to wear both casually as formally. The fabric of our ÅRE shirt comes from a professional local fabric weaver. Due to this self-sourced-strategy we have increased and upgraded the level of comfort, easy to care, look and feel of the product. We proudly introduce you our new dark blue PITEÅ Shirt. This deep dark blue shirt is made from self-sourced 100% cotton fabric. This beautiful dark blue shirt is made from an extraordinary two thread fabric. The fabric is made from 100% cotton fabric which allows you to feel cool and free in this shirt. In this way our PITEÅ shirt has an extreme high level of comfort and fresh feel. This dark blue fabric is woven with two colored thread in blue and black. Due to the two thread weave this shirt has a special deep dark blue color. This deep dark blue cotton fabric creates the perfect look for casual occasions or a stylish formal look. Due to this self-sourced-strategy we have increased and upgraded the level of comfort, easy to care, look and feel of the product. We proudly introduce our new Sundre Marina Linen Shirt. The beautiful seaside area of “Sundre” has inspired us to create the Sundre collection. This collection is made of a unique premium mixed linen/cotton fabric. This fabric is composed of 70% cotton and 30% linen. This fabric composition offers three major advantages. To start the shirt will wrinkle less due to the 70% cotton woven into the fabric. In other words the shirts can be worn longer without wrinkling. Furthermore this premium mixed fabric will be easier to iron compared to a 100% linen fabric. Secondly, the shirt is fresh & cool due to the 30% linen that is woven into this fabric. Because of this you stay fresh and cool on hot summer days. The last great advantage of this fabric composition is the soft feeling of this fabric. Because of the high percentage of cotton in this fabric the shirt does not irritate the body. Additionally our design team made small adjustments in the fit of the shirt. This gives the Sundre collection more comfort and a fresh look on hot summer days. We proudly introduce our new Sundre Linen collection. The beautiful seaside area of “Sundre” has inspired us to create the Sundre collection. This collection is made of a unique premium mixed linen/cotton fabric. This fabric is composed of 70% cotton and 30% linen. Our BÖDA button down shirt is cut from a mix of 50% pure cotton and 50% polyester Oxford fabric. This fabric makes this shirt extremely durable and comfortable. The BÖDA shirt has an authentic button down collar and is designed to wear casually. Due to the amazing “Oxford” weave this fine fabric creates an extreme level of comfort and feel. Our modern slim-fit cut and exceptional button down collar sets you apart from others. This Oxford fabric with contrasting colors in warp and weft gives this shirt a miniature diced pattern. Our mission to create the perfect shirt began with combining traditional craftsmanship with a modern and clean Swedish design. This amazing combination has resulted in a shirt that is made of the finest cotton fabrics, exceptional craftsmanship and pure design. With this approach, we try to break the rules between formal and casual wear. Our clean stylish slim-fit cut and design makes it possible to wear our products at both formal and casual occasions. Creating a shirt with the perfect fit has been a great challenge for us. After multiple designs and hard work in our NØLSON atelier we believe we have created a slim-fit shirt that is the definition of perfection. All our products are hand-made to ensure excellent quality and comfort. More than 11.000 stitches connect over 40 different parts in order to create an extreme durable and strong shirt. The combination of our supreme and extreme durable fabrics, exceptional cutaway collar and excellent tailor craftsmanship has resulted in a magnificent shirt like never before. In order to achieve a supreme level of Quality all NØLSON shirts are made from 100% pure durable cotton fabrics. Our atelier uses 100% cotton fabrics to develop extreme strong and comfortable shirts. Our atelier uses two types of fabrics in order to create the perfect shirt for any occasion. Oxford has a typical basket weave due to its interlinking warp and weft threads. Because the threads running in one direction are colored in light blue, while the threads in the opposite direction are colored white it results in a two-tone diced textured pattern. Due to this Oxford weave this shirt is very popular to be worn casually. A true Piqué is a double cloth with a fine face and coarser back. Our atelier uses Piqué fabric showing rounded, wavy welts in the direction, with pronounced sunken areas between. The deep dark blue color of this Piqué fabric combined with this exceptional wavy pattern creates outstanding look. The Twill weave is a strong cotton fabric in which the threads are closely woven in a criss-cross pattern. By using a fine, dense warp over a coaser weft the Twill weave allows this fabric to be very lightweight. Furthermore this fabric feels cool and breathable because it made from 100% cotton. These key features make this Twill fabric ideal for shirts to be worn under a suit or casual on hot summer days.